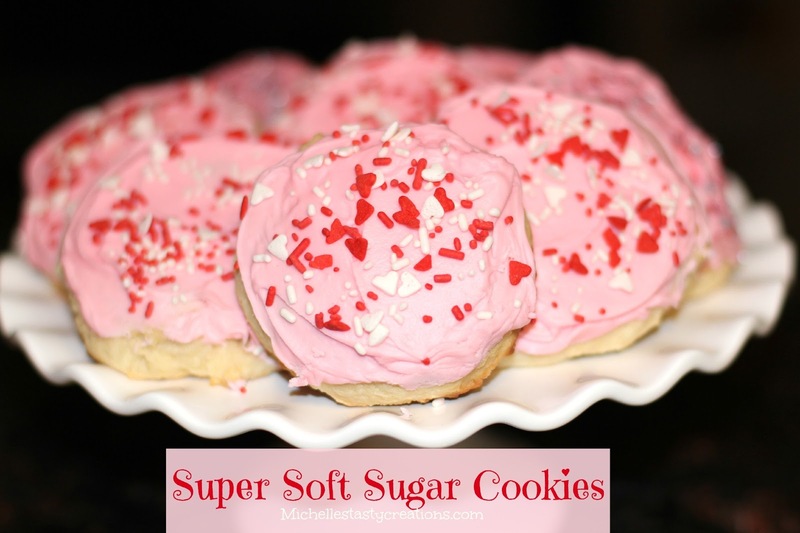 That's about all I can say about these Super Soft Sugar Cookies. I used my Lofthouse Cookie Bars recipe and converted it into giant sugar cookies for Valentine's Day. Armed with a can of frosting (Gasp) and my trusty Pampered Chef large scoop, I made up a batch of these cookies in no time and you can too! In a bowl, mix the flour, baking powder, and baking soda. Set aside. Cream the butter, cream cheese, and sugar until fluffy and very light in color, about 3 minutes. Add in the egg and vanilla extract and beat until incorporated. Add the premixed dry ingredients and mix until incorporated, scraping down the sides as you go. The dough will be very soft. Cover and refrigerate for at least 2 hours and up to 8. Preheat oven to 425 degrees. Line a baking sheet with parchment and set aside. Scoop cookie dough by using a large Pampered Chef scoop or a spoon and make into approximately 1-1/2 to 2 inch balls and space them 2 inches apart on baking sheet. Flatten slightly with fingers. (This picture is before I flattened them slightly) When the pan is ready to go into the oven. Reduce heat to 375 and bake for 9 - 12 minutes or until done and slightly golden on bottom. You don't want any color on these cookies except for the bottom. Let cool 2 minutes on baking sheet then move to cooling rack. Repeat process for second sheet of cookie dough. When the cookies are cooled completely, frost either with Vanilla Buttercream Frosting (found here) or a tub of store bought vanilla frosting. Decorate with sprinkles or jimmies.